Word for Today: I was hungry you gave me food to it! Word for Today:I was hungry you gave me food to it! 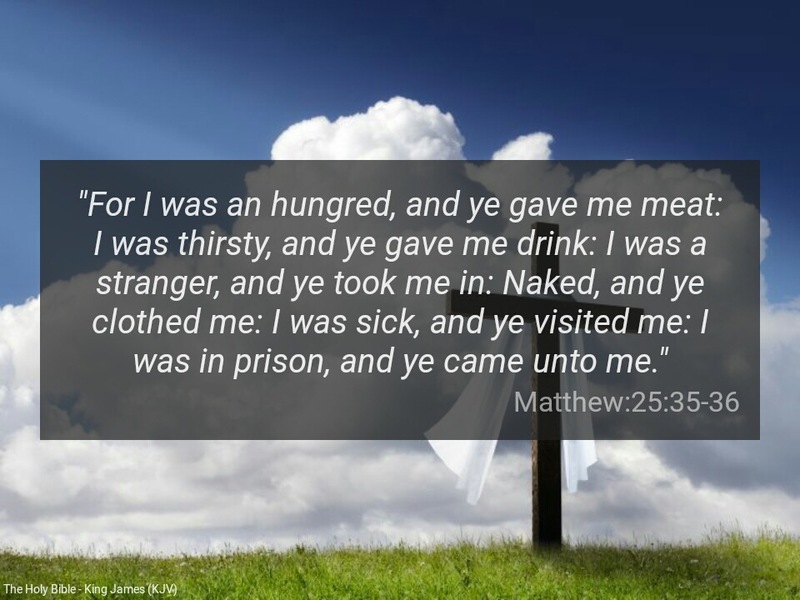 “For I was an hungred, and ye gave me meat: I was thirsty, and ye gave me drink: I was a stranger, and ye took me in: Naked, and ye clothed me: I was sick, and ye visited me: I was in prison, and ye came unto me” (Matthew 25:35-36). Every good thing you can do to every one you come across, please do it without delay or judging. There is really no time to waste when it comes to doing good to others. The anointing we have received from the Lord is for goodness; exactly the anointing He Himself received from the Father (Acts 10:38). Many of us discriminate so easily , especially if the person we are dealing with belongs to a different FAITH. Remember Saul before he became apostle Paul in Acts chapter 9. In essence, the word of God is asking every one of us to be hospitable to everyone we come across as if we are meeting with JESUS. This can really create an opportunity for what some people have called ‘befriending evangelism’. “Let brotherly love continue. Be not forgetful to entertain strangers: for thereby some have entertained angels unawares” (Hebrews 13:1-2). Father, we pray that we shall never see you ( or anyone) in need without attending to you in Jesus mighty name. Amen. Previous Previous post: Word for Today: Are you destroying the works of the devil? Next Next post: Word for Today: Choose Life and Live.